General Reliance specializes in the manufacture of custom molded & overmolded Neoprene (CR) Cable Assemblies engineered to your highest standards. Our products are regularly engineered to withstand severe environmental conditions including extreme heat and cold, salt spray, water immersion, chemical and abrasion resistance, and electromagnetic and radio frequency interface. Our cables provide proven performance in the field and have been tested to excel in your harsh environments. Wherever possible our product is tested by utilizing ATP equipment. Neoprene is the trade name for Chloroprene Rubber (CR). Neoprene cable assemblies are chosen where good resistance to heat, weathering, aging and ozone is required. The material has good mechanical properties and resilience, but poor resistance to fuels. Also, the material is subject to stiffening and crystallization at low temperatures. Combined with our expertise in molded cable assembly, choosing General Reliance as your vendor is the smart choice. Water proof construction greatly improves moisture and corrosion resistance in the field. Superior strain relief provides excellent mechanical protection in harsh environments. Improved electrical insulation increases system reliability. Flex induced stress on connector contacts is eliminated. Molding and curing process prevents wire insulation cold flow that mechanical clamps induce in service over time. 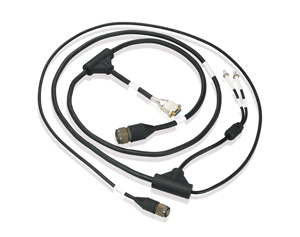 Molding process allows the cable configuration to enter the connector from any angle.